Truly a sportsman’s paradise! Situated just south of the Groton State Forest, this 31.75+/- acre property is the perfect recreational retreat with much-desired seclusion. Boasting 877’ +/- of road frontage on Class 4 Kimball Hill Road, it is accessible from both Route 25 and Willey Hill Road. 1.9 miles of Kimball Hill is Class 3 – only one other camp located along the entire Class 4 section! Primarily Hardwoods with very prominent Sugar Maple growth, this is also a great opportunity for anyone looking to start a small sugaring operation. Existing logging road and Old County Road provide easy access for your recreational vehicles. Prominent wildlife with active game trails throughout the property – also very close to Pine Mountain WMA and Groton State Forest. Minutes from the 400 acre Lake Groton – known for largemouth and smallmouth bass, several species of panfish and yellow perch. VAST Trails immediately accessible from the property with Corridor 302B serviced by Topsham Ridge Runners, providing access to over 40 miles of trails throughout the area. Washington Electric Co-op power pole located at Kimball Hill and Willey Hill intersection although implementation of power would typically only occur if a full time residence was built. 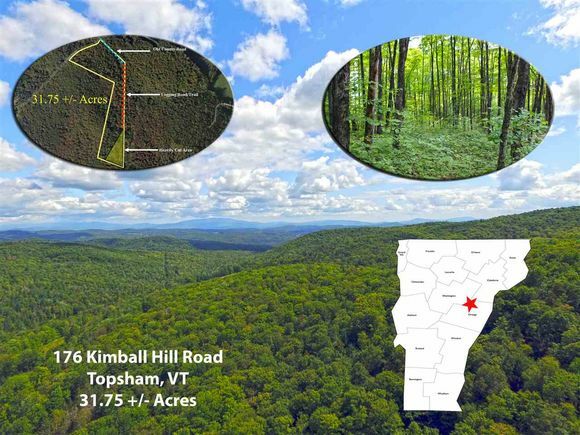 The details on 176 Kimball Hill: This land located in Topsham, VT 05076 is currently for sale for $29,000. 176 Kimball Hill is a – square foot land with – beds and – baths that has been on Estately for 601 days. This land is in the attendance area of Waits River Valley School and Oxbow Uhsd 30.